After regaining my composure, I proceeded to read the article in the hopes that the title was surely satirical because there is no way in the world a serious person would be making the comparison between the assassinated civil rights leader and the Fox News television host. But I was wrong. Whereas Malcolm X embraced militant black separatism, Beck marries a stridently emotional style with political views that wouldn’t have been out of place at a 1950s Elks Lodge event. Malcolm X's legacy should not be defined by black separatism as it is simply one part of his narrative. I would argue that his black separatist beliefs were products of the times with which he lived. While Beck and his supporters are constantly ranting about wanting to "Take Their Country Back," Malcolm wanted oppressed blacks to see exactly who was responsible for oppressing them in order to move forward from a position of strength. If breaking the yoke of institutional racism and white supremacy meant creating separate institutions under which blacks could thrive then so be it. And just as Malcolm X mellowed in his old age, embracing a more traditional interpretation of Islam shortly before his death, Beck seems to be self-consciously moving past the politicized anger that defined his program for much of the past two years towards a heavy emphasis on spiritual uplift for his people. 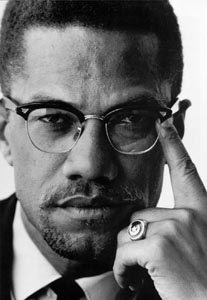 I hate to point out the obvious, but Malcolm X was assassinated in 1965 at age 39. He did not "mellow in his old age." On the other hand, Glenn Beck referred to the Obama administration as the "Planet of the Apes" approximately 3 weeks ago. Guess that's an example of Beck mellowing. Yes, this is true. Glenn Beck and his sidekick Sarah Palin avoided overtly political rhetoric this past Sunday. But while Malcolm's beliefs evolved over a number of years, they were a result of his break with the Nation of Islam and his pilgrimages to Mecca and trips to Africa. It may just be me, but all that has changed for Glenn Beck, in a matter of months, is an increase in corporate sponsorship and a more mainstream audience that apparently has forgotten he said President Obama was a racist who has a deep seeded hatred for white people and white culture. And while Malcolm's gradual transformation occurred over a period of time after many years of studying and reflection, it appears that Beck's transformation from shock jock cable news host to Billie Graham style televangelist occurred just as the religious right and Tea Party types needed to be mobilized in time for the midterm elections. Malcolm studied and acknowledged his shortcomings, Beck has done nothing of the sort (unless you count Glenn Beck University...okay maybe not). I encourage everyone to read the article here and add their own critiques in the comment section below. (h/t Mark Thompson and Dr. Goddess for contributing their thoughts and helping me with this post).